The whole world knows that Superman and Clark Kent are the same person now. And lots of people are angry at the Man of Steel, including the cops and Lois Lane. But his former editor-in-chief might be madder than anyone on the planet right now. The fallout from the revelation of Superman’s secret identity has been fun to read. Various creative teams have portrayed Clark as desperate, brash, humbled and angry of the last few months. Current girlfriend Wonder Woman is super-protective of her newly vulnerable beau but he hasn’t been shown interacting with many other characters just yet. Kal-El’s first meeting with the new Batman didn’t go that great, with the mech-suited Dark Knight walloping him hard and trying to arrest him. Former police commissioner Jim Gordon is the guy running around wearing a pointy-eared costume and trying to save Gotham nowadays. He’s not sure he can trust Superman, who—no matter how you justify it—has been lying about leading a double life. Their first team-up has been rolling out in recent chapters of the Batman/Superman title. In this week’s issue #23—by Greg Pak, Adrien Syaf and others—Batman goes to Metropolis to talk to people who’ve known Clark Kent. Perry White, who hired Clark Kent at the Daily Planet, has nothing nice to say about his former employee. Perry’s almost always been portrayed as a gruff older boss with a heart of gold, someone who really cares about getting the truth out there above all else. 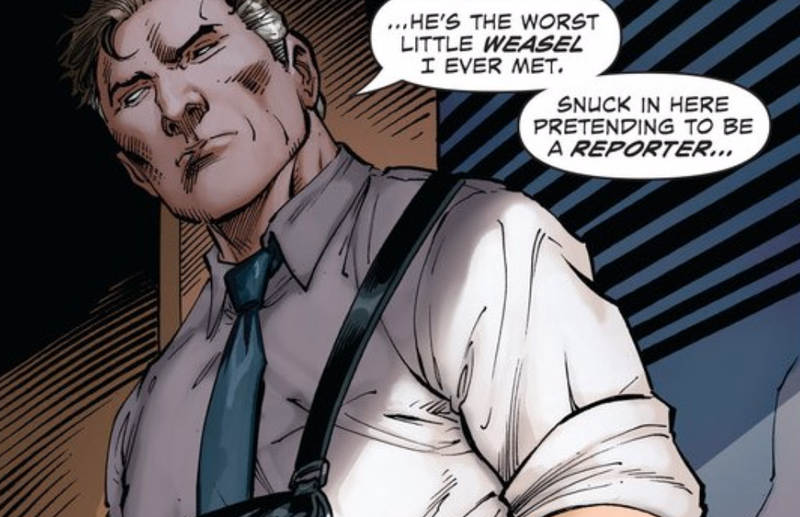 While calling Superman a weasel may seem harsh, it’s in keeping with how the guy in charge of The Daily Planet sees the world. Superman’s got a hell of a lot of relationship repair ahead of him.